The wild fig or ficus is found growing wild in the Mediterranean and is native to Persia, Asia Minor and Syria. An ancient tree, its fruits have been used for centuries and it is mentioned in the Bible. The ficus is a medium-sized tree growing up to 20 feet tall. Wild figs are long-lived and are deciduous in cooler climates but evergreen in mild areas. The tree produces a fruit that is fleshy and sweet. Figs are a member of the mulberry family. They are easily recognizable by their thick milky sap and bulbous fruits. The fruits have an ostiole or eye which is not connected to the tree. The eye is an opening that helps the fruit develop with the environment. The fruit is the reason the plant is in cultivation but the tree develops interesting skeletons and growth habits that make it an attractive ornamental or tropical curiosity in the home garden. The leaf the statue of David wears is a fig leaf, perched to protect his modesty. The leaf shape is familiar throughout history and is deeply lobed except in wild habitat, where the leaves tend to be smoother and less lobed. The leaves are thick and leathery and deeply veined. The leaves are bright green, alternate on the branch in singles, and are quite large. The leaves can be up to 1 foot in length. The leaves carry rough hairs on top and softer hairs underneath. The lobing will vary by species but is generally five to seven lobes. Figs grow as trees, shrubs or vines in tropical to semitropical areas. Wild figs are common in the Himalayas (Fegra fig), South Africa (wild willow leaf fig) and India (Banyan fig or strangler fig) as well as many other temperate areas. Figs are categorized by fruit. Caprifigs are hermaphroditic and only goats eat them. They are pollinated by fig wasps which live in the caprifigs. They do not nest in the edible figs. When the wasp nests she pollinates the female flowers. There are 800 known species of fig, most of which produce edible fruits. The edible fruits produce twice yearly and the first crop is called breba, while the second is olynth. Fig leaves are not generally considered as edible today, but in some cultures and in different times in history they were an important food source. The leaves seem to have an anti-diabetic property and lower the amount of insulin a diabetic must use. 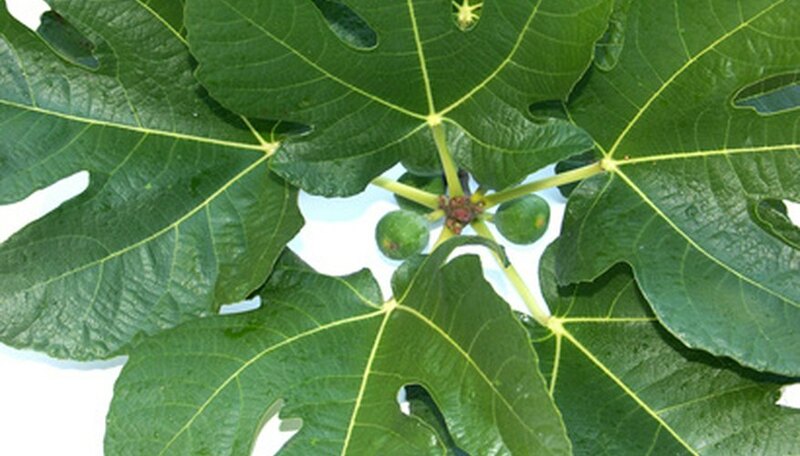 Fig leaves are used for animal fodder in India, and in France the leaves yield a substance used in perfume. The substance is a brownish-green mass with a herbaceous mossy odor that is used in "woodland" scents. This virus is considered desirable in plants like flowering maple and was long thought to be benign. Recently, it has been decided it leads to crop loss. The leaves of the wild fig affected with the virus become mottled and the veins turn a lighter color. The virus spreads among ficus quickly, but often the symptoms are not initially apparent. They come out when the plant is stressed or in extreme heat or drought.